You must not do this anymore, for this is one of my biggest pet peeves. I absolutely cannot stand to reach into the tin for a paper clip and bring 18 others along with the one that I grab. 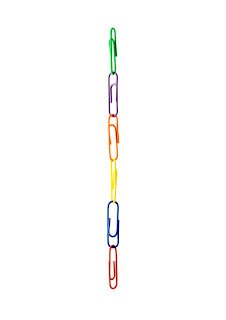 Please disassemble this paper clip chain immediately and find something useful to do, as you obviously aren’t using your work time wisely. Thank you. 5. Be subjected to other to-be-determined consequences. I love that it was a paper clip chain that sparked that sign. Reading this totally made my procrastinating worth it. After having regained my composure now (this post made me giggle so long that the hubby asked me if I wanted to sit in a straight jacket) I am finally ready to reply. We’re freaking so much alike. I hate, hate, hate paperclip chains. Seriously in our Weight Watchers meeting they handed out a big paperclip at the start and then each time you lose a pound you get another little paper clip. You’re supposed to build a long chain to show your progress but I can’t bring myself to do it. It makes me so mad that clinging together of clips when you need them in a hurry. LOL! I think I need you to write a note for me soon! For some reason this absolutely cracked me up – it reminds me of an Office episode or something. You should totally post this on Passive Aggressive Notes! And…what was the reaction? Did the chain leader come forward? You know what I hate? Rubberband balls. LOL!!!! The kicker is that the time-wasting person LEFT the chain intact…..if you’re wasting time at work, you shouldn’t make it obvious…. Ohhhh, not only did you have to deal with a paper clip chain — I’m with you on those — but you have to share your paper clips? I don’t share so well. I like mine the way I put them and I don’t want anyone messing with them. And the Weight Watchers? Seriously? Maybe that’s why I can’t bring myself to do WW. Subconsciously, I knew…. Damn, you’re tough! But what if that poor person got stuck in the supply room and the only way out was to fashion a chain of paper clips to pull themselves to safety? I was at the mall once and the escalator broke down. I was stuck on that thing for like an hour and a half before they finally fixed it. I could have used that paper clip chain then. Michelle: LOL! You don’t enjoy sharing paper clips, huh? That’s funny: I love that! Maybe if this chain thing happens again I will take my own stash of clips and hide them. Nukedad: Hmm. You’re right. I should have been more sensitive to a possibly life-saving situation. And thanks for jumpstarting my brain this morning: I had to read about your escalator escapade two times before I got it. Bwahahahahaha!!!! I’m awake now! My mom used to have a jar of paper clips right next to the phone in the kitchen and I’d make chains while on the phone and not even realize it. She would be furious, but it was such a bad place for them. It was either doodle or make chains while talking on the phone. Oh, I HATE paperclip chains! Grr.